A water regulated environment for farmers to grow high yield crops during the wet and dry seasons. Protecting crops in times of flooding. For the Bangladeshi, flooded streets or houses do not represent a major problem, but the loss of crops is a major setback due to the scarcity and price hike of new saplings. During the monsoon, farmers are only able to grow rice in the lowlands of Bangladesh. 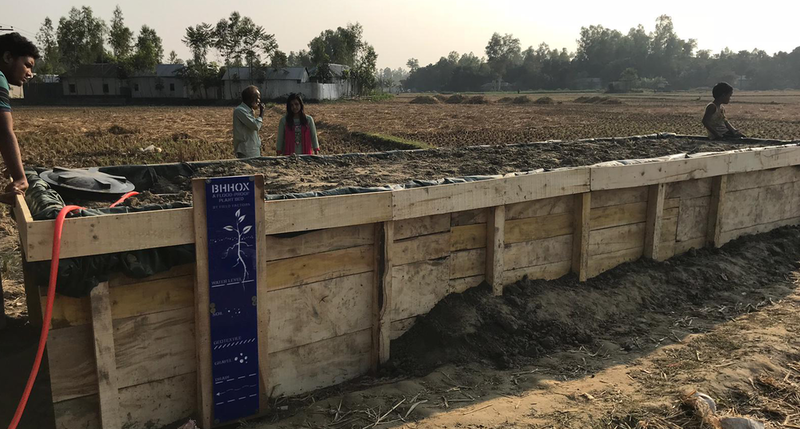 The objective of this project was to develop and implement a flood-proof prototype, allowing farmers to grow young crops all year round, in the framework of the CORE project of the Urbanising the Deltas of the World II Programme, funded by NWO. Applying our knowledge on retention and bio-filtration, we developed a flood-proof planting bed with level-controlled drainage and re-circulation of drain water. With Bhhox, farmers are able to produce high yield vegetables in the wet season, protecting crops from flooding. In the dry season, the water usage of the system is optimised to retain freshwater for a longer period. This way, farmers can grow crops in the wet and dry seasons, regulating the irrigation of the crops. Dutch water knowledge was, through rapid prototyping, translated into a working prototype that functions in the local context of Bangladesh. The system was built on location at the beginning of December 2018, during 4 working days, with support of the BUET University and the local NGO SHARP. Instructions to operate the system have been provided to the farmer. The system will be monitored during the next 2 years, providing insights into the long term performance and potential scalability. Because of the language barrier, we were equipped with a 1:5 prototype to communicate shapes, functions and connections, facilitating the construction and installation works. During the construction of Bhhox, maximum use was made of local available materials, resources and manufacturing facilities. All materials were collected locally. The farmer owning the Bhhox in Siranjganj has successfully harvested chilies for the second time and is now experimenting with growing onions as well. By creating a safe and regulated environment for farmers to grow their crops, this technology contributes to economic stability and creates opportunities for income generation. The project “COmmunity REsilience through rapid prototyping of flood proofing technologies in urban areas, Bangladesh" (CORE) is funded by the Netherlands Organization for Scientific Research (NWO). The project is carried out by IHE Delft and the Bangladesh University of Engineering and Technology, with support of local NGO SHARP.